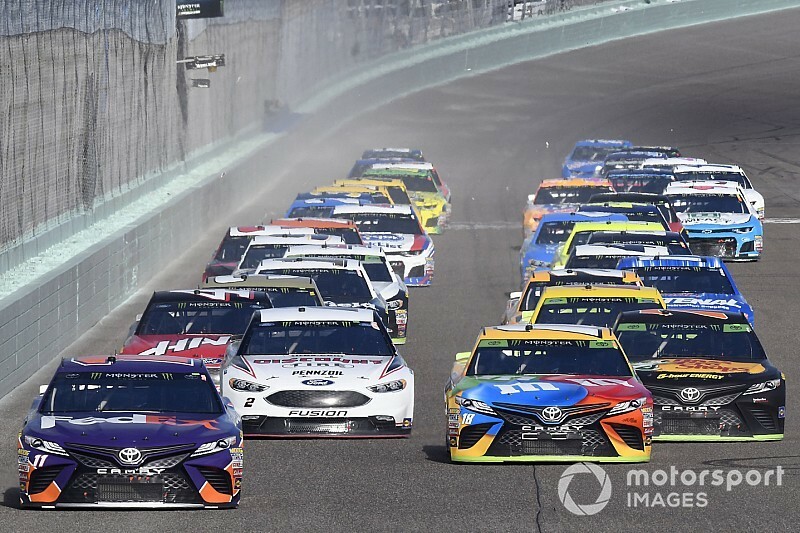 Motorsport.com's Jim Utter, Nick DeGroot and Tim Southers tackle championship weekend and look ahead to 2019 in this week's edition of the NASCAR Roundtable. Joey Logano has been in the Cup Series for ten years but has just won his first series title at age 28. Where do you see his career going from here?" Jim: The potential is there for Logano to get on a Jimmie Johnson-like run. The only thing that would prevent him from winning a similar number of championships, in my opinion, is the winner-takes-all format in the season finale. It makes it extremely hard to (1) reach that race on a consistent basis, but also (2) consistently win it. Clearly, though, Logano is among the sport's top talents right now and at only 28, he likely will remain so for a long time to come. Nick: Joey Logano has been in this position before, so it's no stretch to say that he could win multiple titles. And again, he's only 28. He has a lot of years left with so many more opportunities to go for championships. I expect him to one day boast numbers that mirror the likes of Kevin Harvick and Kyle Busch, who I have to say I'm very surprised haven't won multiple titles yet. But at his young age and with one title already in the hand, the sky is the limit for a driver like Logano. Tim: I could easily see him winning multiple titles with Team Penske. He and his crew chief Todd Gordon and the entire team seem to really have good chemistry. I think a telling sign of this is how they rebounded from the rough finish in the finals in 2016 and also struggled through the 2017 season and came back strong in 2018. This shows their resiliency and resolve as a team to overcome obstacles and remain a tight-knot unit. This could help him win a handful of titles before he retires as he is only 28 years old. Do you think NASCAR needs to tweak the playoff format any moving forward? Jim: No. Every year we hear ideas on how to fix some part of the playoff system. Honestly, I don't know how you could produce a playoff system any better in terms of producing good storylines and encouraging participants to go above and beyond in order to advance. Outside of changing at some point one or two more races within the playoffs, I would leave it just as it is. Nick: Please, don't. And that's without even analyzing the current format, because yes it does has flaws. It just isn't good to constantly mess with the format that decides your champions. There's already those who question the current format's integrity and who the 'true champion' is with so many changes over the years. This format, for the most part, has done well and produced great postseasons, so they should hold back on making anymore changes in the immediate future. Tim: I hope not. To me, NASCAR finally achieved its best ‘Game 7’ moment this year in the finals. You had the four best performing drivers overall for the entire season in the Championship Four and on the late restart the four all restarted the race in the top four positions with just the final four racing for the race win and championship. To me this is exactly what NASCAR and many fans wanted to see and we got that last weekend in the season finale. To make any changes now would a bad idea in my opinion. What will some of the top story lines be going into the 2019 season? Jim: Several strike me right off, including the introduction of a new aero package and how that will alter the look of racing going forward. Chase Elliott was the only Hendrick Motorsports driver to win a race this season, it will interesting to see if HMS can continue to improve and get their three other Cup drivers into Victory Lane. How will Martin Truex Jr. and crew chief Cole Pearn fit into Joe Gibbs Racing now that Furniture Row Racing is no more? And now will NASCAR's new executive leadership, coupled by its offer to purchase International Speedway Corp., change the course of the sport? Nick: Truex's move to JGR and how he hits into that organization is something I will be paying close attention to. I'm curious to see if he and Cole Pearn lose a step and how working with their new teammates will go. There's also the introduction of the Mustang and the question of if Jimmie Johnson can pull himself out of this slump with a new crew chief for the first time in his career. Tim: To me the biggest storyline will be the new rules package and what it does to performance and race action on the race track. To me this is one of the biggest moves NASCAR has made in the history of the company and the results could shape the sport for a decade to come or it could create another huge hurdle NASCAR will have to overcome. In addition to the package for the intermediate tracks, seeing how the removal of the restrictor plate will affect racing on the Superspeedways. Also the recent news of NASCAR wishing to buy controlling interest of ISC will also be a big storyline I feel next year. How refreshing was it see Brett Moffitt and his small team win the NASCAR Truck title and should it give other small teams hope in the future? Jim: The success of Hattori Racing Enterprises continues to show the importance of getting the right people within an organization - irregardless of they are high-budget or low-budget. If it can be done by a small team in NASCAR, I would guess the Truck series is the most likely place, given its shorter schedule and a lower reliance on aerodynamics than in the Cup or Xfinity series. I would hope Moffitt's stellar season helps him earn another shot in the Cup series with a solid team - I don't think he would disappoint. Nick: Shigeaki Hattori proved what can be done with few resources, if managed correctly. They made the most of what they had and beat the best with it. They showed there is a path and I hope other teams are able to mimic it because it's no good to have a handful of select powerhouses dominating the schedule. Tim: When I worked in the Hooters Pro Cup Series, Bobby Gill was one of the best there was to drive in the series and win titles. He always said he would put money into his cars instead of other stuff that didn’t matter and he also made sure he had the right people working on his cars. Hattori Racing proved to the NASCAR world that you don’t have to have the biggest budget if you have the right people in place and team owner Shige Hattori accomplished that in 2018 and it gave them a title which I hope is a sign of things to come in the future with other new team owners.